Dave Hadgkiss calls Vancouver home, and is the man behind Folk Thief. He's set to release his debut album, Love Heartache & Oblivion. 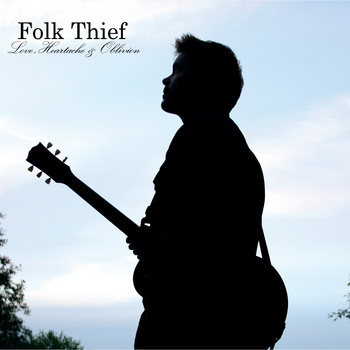 It's listed as "Folk and Country", and if you gave me this album 5 years ago, I wouldn't have given it a chance. But we live in the now, and the now says this is well worth anyone's time. 10 tracks later and I'm ready for more. It's a pretty twangy listen at times, and Hadgkiss really has a country feel to his vocals. Other times I can hear the folk side of things much easier. He seems to play between the two effortlessly, giving the album a diverse feel, and a quick flow. He also has some beautiful back up singers, which really shine on a few of the tracks. "A Light for Liberty" is the second track on the record, and one of my favourites. It's one of those songs that makes you want to play guitar, or learn to play guitar. Hadgkiss also sings along in a pretty cool way. "The Devil Behind Me" would be my other favourite on the album. I guess growing up in Kamloops, Dave was in a geek/punk band, and did a lot of screaming. He's got a tiny bit of that left in him, and he lets 'er go in this one. It's a good one to vent along with. It's got a slow build, and you feel great when you hit "the moment". Dave's got shows lined up in support of the album in both Vancouver and Victoria. I can't say he's not going to go through Love or Heartache, but this album should steer him well clear of oblivion.